Street Meat Being Served From Beyond the Grave! Who knows? That grub they're in line for may be being sold in the name of a dead man. 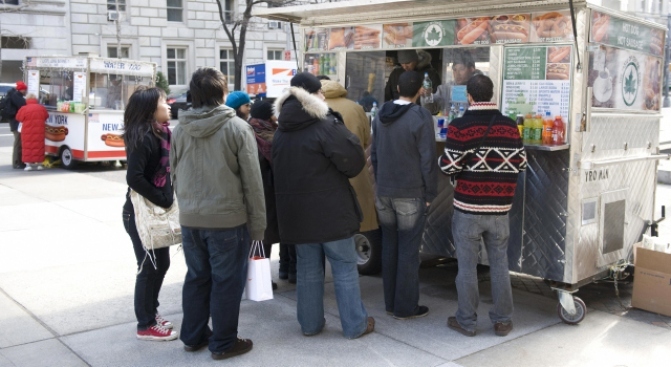 If you've always dreamed of selling hot dogs on Sixth Avenue, the wait for a street vendor license can take years -- or you can go into business with a dead man. The city has launched an investigation after learning that some folks are renewing by mail licenses originally issued to people who are dead or no longer in the country, reports The New York Post. More shocking still, they're doing it for profit. Renewing these permits, which has to be done every two years, costs only $200. What some scam artists are doing is leasing the permits to a third party, whom they charge as much as $10,000 -- or 50 times the actual costs. With a waiting list that sports more than 3,000 names, the expensive short cut is worth the price, and there is no shortage of opportunities. In Long Island City the Post found a man, who identified himself only as Mario, willing to sell a brand new food cart for $26,000, "cash only." And Mario would renew the license -- in the name of the original holder -- for another $10,000 every other year.